Brutal Pixie’s old mission statement gave us indigestion. This article explains why, and walks you through the creation of our new one (and why we love it). We changed our mission to something we can strive for, even in an unimaginably different future. Since Brutal Pixie began in 2013, our mission has been pretty thin. It was never something that grabbed you by the throat and made you excited. Nor did it truly shine a light on the company’s role in any kind of future. What was that mission? It was, ‘Helping businesses to connect’. The idea of ‘connection’ is central to content strategy work. It’s the conduit between your business and your audience, not least because it begins with your strategy and involves thinking about your audience’s perspective. But there is something so boring about that vision. It was so.… bleurgh. The original mission, to me, has always been a bit like unflavoured rice pudding. Rice pudding is nourishing. Even if when it’s unflavoured you can finish your serving without difficulty. But as the founder of Brutal Pixie, it has always given me a bit of indigestion because it was problematic. The problems with the mission begin with the word, ‘connect’. What does it mean? If you are a designer, public relations pro, or interaction designer, you get it. The rest of the world struggles. In our early days, people would ask, ‘So, what does that mean, really?’. Great conversation starter. Terrible connection maker. Brutal Pixie’s founder says her company’s mission statement was like unflavoured rice pudding. It gave her indigestion. applicable even when we’re in a science fiction future. The mission also had to sit easily if we were to retrofit Brutal Pixie’s history. Reflecting on all of the amazing clients and projects we’ve worked on, can it still apply? And then, if the world changed dramatically, does the mission allow Brutal Pixie to evolve? If our company is going to be around in 20 years, 50 years, 200 years, will we still be relevant? And if so, how? If you immediately ask, what’s it mean to be human? * allow me to applaud you. In an age of machines, fake news, algorithm‐​written materials (and more) it’s a very important question. At Brutal Pixie, we’ve defined it as having an empathic and emotional connection. You might think of it as a heart connection; as having a soul; as something completely different. We’d love to hear your thoughts. The Brutal Pixie mission is as applicable now as it is when we’re all on Mars and are living with robots (which is probably closer than you think). It also speaks to the roots of content strategy, which is people‐​centric. Human communication is also socially oriented. To be social means that you have to be able to connect with people. To have a mission that ticks all of our boxes is enormously exciting for us, because it feels like our foundations and our future are now intrinsically connected. And that feels amazing. 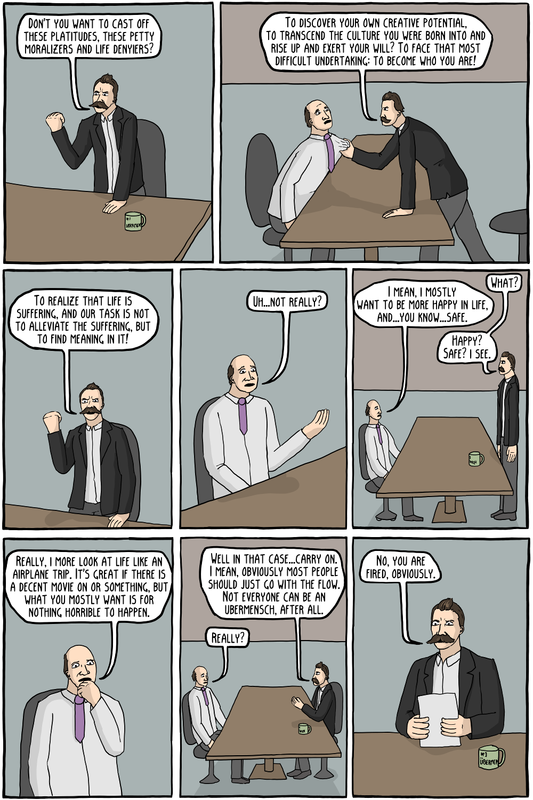 * You might enjoy Existential Comics. Here’s a sample. This is Existential Comic #161. Read more at http://​existentialcomics​.com. Cook, Gareth. 2015. ‘Why we are wired to connect’ in Scientific American.